Discover a labyrinth of creativity in the iconic Waterloo space. The House of Vans is the physical manifestation of the culture and creativity that have defined the Vans brand since 1966. Always embracing and fuelling creative expression through art, music, skateboarding, BMX, street culture and fashion, the space offers a solid platform for the local communities to experience and engage with Vans’ ‘Off The Wall’ spirit. 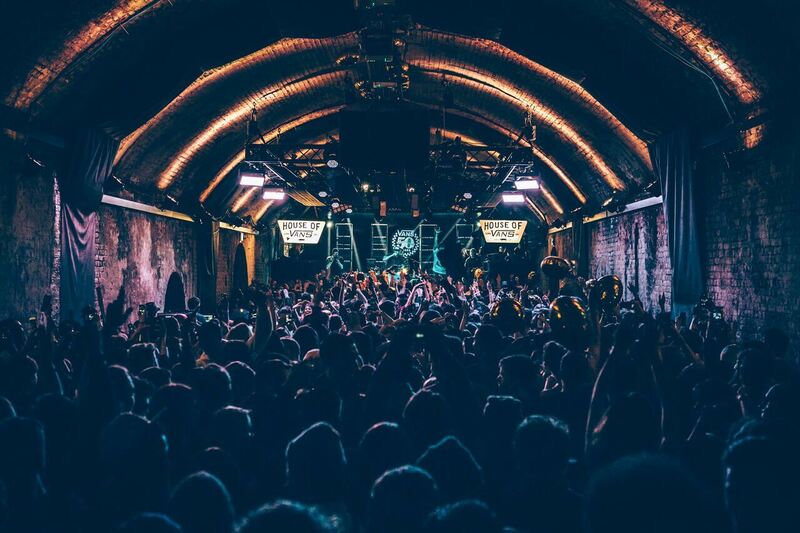 Situated in former Old Vic tunnels, Vans has transformed the 30,000 sq ft space into a hive of cultural activity. Let the glow of neon lights and the iconic chequerboard flooring guide you into a succession of tunnels which includes a gallery, cinema, music venue, diner and last but not least a concrete bowl and ramp designed by pro skaters. The packed programme of events is almost always entirely free. Free. Skate sessions, cinema screenings, exhibitions and concerts. Booking required for some events. Fully accessible to disabled guests. The Wall SE1 is a New Yorker cafe/diner with influences from ever-changing street food scenes. The diner is located in Tunnel 4 of House of Vans. The Waterloo Tunnels were used as a morgue during part of WWII and were known as Necropolis Station. Street artist Banksy used the tunnels for the premiere of his award-winning documentary ‘Exit Throught the Gift Shop’. More recently, Foo Fighters played a secret show here under the moniker of ‘The Holy Shits’ in September 2014. Public Enemy chowed down on The Wall SE1’s infamous buttermilk chicken wings.